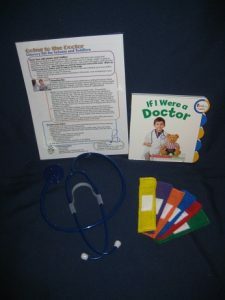 Whether for a well baby check up or taking a sick child to the doctor, this kit will help you and your baby feel more comfortable about going to the doctor. It will help you explain to your child what to expect as well as sickness prevention tips. 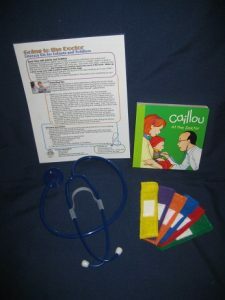 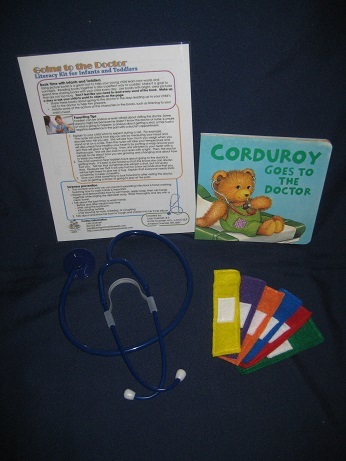 Included in this parent pack are a two-sided guide, a stethoscope, six felt play band aids and your choice of any one of three board books: Caillou at the Doctor, $15.00; Corduroy Goes to the Doctor, $15.00; and If I Were a Doctor, $16.00, all housed in a clear, plastic, zippered pouch.